So Gus Poyet thanks his lucky stars he could ditch Jozy Altidore to sign Jermain Defoe, proclaiming them a whole new team that will now give the novel concept of facilitating striker chances a whirl. I'd wonder what Steven Fletcher and Connor Wickham thought of those comments, but let's stayed focus on the dis. Then, the seemingly delusional Poyet (Sunderland can propel Defoe back into the England set-up!!) instantly benches Connor the former savior-with-a-long-term-contract in favor of his new exorbitantly-priced, 32-year-old small forward, who has not played since October and has not scored since July. After today's 2-1 loss at Tottenham, which saw Defoe (reportedly on about $110,000 per week salary) worth all of 12 offensive touches in 75 minutes, the ex-Toronto FC man has two goals in his last 29 EPL contests. Don't let me confuse the issue and let you think this is about criticizing Defoe. No no... right now I'm thinking he is both a freakin' fiscal genius and a figure for impending sympathies. And I say this about a guy who will probably score about as well as anyone short of Messi could in this Sunderland side coached by that manager, because he will look to fire at will from anywhere (a ka the mindset Altidore never adopted to adjust, his biggest gaffe of the tenure). Would you like a real post-mortem stat on Altidore's overall play and who should point fingers at whom for his general failure during a self-imposed Black Cats sentence? From his arrival to departure, against all Prem opponents (including six cup matches with Chelsea, ManU, Stoke and S'hampton), Sunderland averaged a goal every 66.8 minutes with him on the field and a goal every 103.1 minutes with him as a spectator of some sort. Yup. And the rage was even more displaced this season, when Altidore struggled like hell for league minutes after a World Cup injury gave him the late preseason start. This term, Sunderland has hit 11 times in 1,399 minutes with the American watching, giving them a goal every 127.2 minutes. With him on the field, they have scored eight times in 311 minutes, or once every 38.9 minutes played. Yeah, you are reading that correctly. During Altidore's rare chances to see the pitch, Sunderland actually scored at a rate more than three times higher than without him. Today, they managed but three shots until trying to rally in the waning moments and Defoe was helped to do less than nothing. So who really ruined whose time here? In truth, they should be happy Altidore didn't bag those two or three head-scratching misses, which gave the boss and the rest of that squad ample cover from the bashers' nasty stick. He didn't just occupy defenders while he was there, he occupied most of the UK media jabs and local flamethrowers as well. As the American pulled a DNP in four of his last five games on their books, an irate majority on the fan message boards suddenly decided that Wickham had become terrible. And Poyet was totally clueless. And the midfield created nothing. And the team passes poorly all over the field. Etc etc etc. The reality is Altidore was bad by his standards, but Sunderland collectively were and remain even worse by quite a ways. Hey, remember their worst losses of all? The 8-0 to Southampton, the 5-1 to Spurs, the pitiful 3-1 loss to newly-promoted Crystal Palace last season. The US striker left not one footprint in any of those debacles. #COYS! We wish our partner @SpursOfficial all the best today as they take on Jermain Defoe and Sunderland. Brilliant article Greg. Haters gonna hate on Jozy, but there has always been "that crowd." Blunderland was a poor fit for Altidore and at times he underperformed, but then again that whole team seems like a poor fit for the Prem. And don't get me started on Poyet. What a buffoon. Hey, this productivity is on its way to MLS. There is no need for Toronto to rub it in however. man those goal per minute stats were eye opening. don't get me wrong it was obvious that they were a better team with him on the field... no clue it was THAT drastic. kind of funny that defoe is now on a team that is even more selfish than his old tottenham mates. tee hee. Jozys time in the epl is what it was, 70 appearances 2 goals scored. He will make a strong showing in MLS. He better! Nowhere have you seen me suggest he was good or suitably productive at Sunderland. I am saying the team he leaves behind played better when he was on the field than when he was not, meaning he is certainly not some huge Sunderland problem solved simply by leaving. Him leaving Sunderland will likely be a career problem-solver, though. Bravo. This should be printed on ESPN soccernet. Greg, you think Jozy ends up back in a top league at some point, or are we looking at an MLS lifer from here on out? I'd have to think if he remains the NT #1, does well and has a good Copa America, he might get some interest in the summer of 2016 where funny enough, at 27 he'd be entering his prime. Or am I being too hopeful and both Mike and Jozy are now permanently at TFC? All your articles are good... best article ever. Saw something wierd on twitter... Is Bocanegra coaching with USMNT? or assisting in some capability? Bocanegra was an assistant at one recent youth camp, don't remember which age group. Same with Coby Jones, Friedel, etc. Best Jozy article. Ever. Something I've been, and most people who actually know a little something about the team dynamics of soccer, since he went to Sunderland. Yo this is some hot fire right here. Greg spitting the truth unfiltered. So glad I don't have to watch anymore Sunderland games in order to catch a rare glimpse of Altidore. That sh*t painful to watch. Louis van gaall commented recently about falcao. He stated he was brought in to Man U for one reason: to score goals!!! Oops! So can we expect a follow-up article? 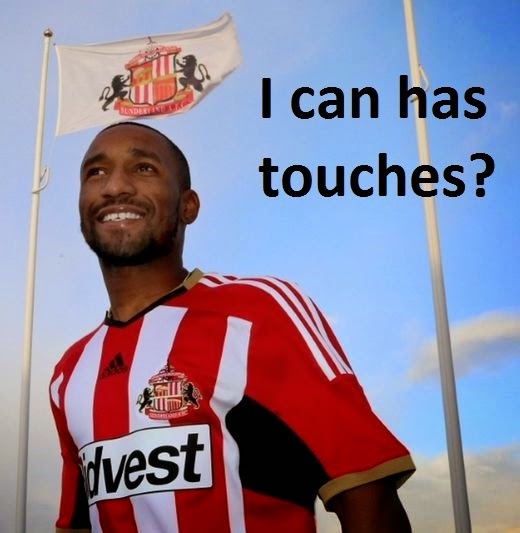 In three games, Defoe has already scored more BPL goals than Altidore's output in one and half seasons. For that matter, Wickham also scored another one. You should write more articles about Sunderland...it's like the anti-jinx. Yesterday, Defoe got a pass at midfield, ran on his own and shot from outside the area. In what way do you think that was a product of Sunderland team play? I have said many times that Defoe will probably score about as well there as anyone because he typically does not wait for service and can actually hit the target from distance. I also said many times that was precisely the biggest thing lacking from Altidore, who I repeatedly said was under-performing at Sunderland. But yeah, Sunderland have four goals in their three EPL games with Defoe around instead three every three. Yowza. Step aside, Real Madrid.